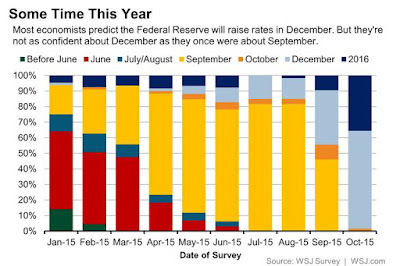 The latest Wall Street Journal survey finds that while a majority of economists continue to expect the Fed to hike rates in December, as a whole they are less confident than they have been. Moreover, as this Great Graphic illustrates, there has been a marked increase in those who do not expect a hike until next year. Note that the survey was conducted prior to yesterday's release of the FOMC minutes from last month's meeting. The WSJ survey found 64% of the economists surveyed expect a hike in December. In August, 82% expected in September. The survey also found that 23% expect the first hike will be delivered in March, the most common response after December. When assessing what the December Fed funds futures contract has discounted, the key is where Fed funds will average after a hike. The contract does not settle at the policy rate, which is now a range, but at the effective average rate for the month. In recent weeks the average effective rate has been 13 bp. If it averages that in the first half of December, and the Fed hikes rates on December 16, and the funds rate averages 25 bp in the second half of December, the fair value for the December Fed funds futures contract is 18.8 bp. Currently, it is trading at 19 bp. The popular models assume that the Fed funds will average the middle of the range, but this need not be the case. It may be averaging around the middle of the range now because of the zero bound. Unlike past cycles, the Fed now pays interest on excess reserves. The Fed says that interest on reserves will play a key role in managing the normalization of monetary policy. A wide spread between the interest on reserves and the Fed funds market can increase the effectiveness of the tool. Moreover, if the Fed wants to signal that the rate cycle will be gradual, it could achieve this may providing sufficient liquidity to keep the Fed funds at the lower end of the target range. The assumption that Fed funds will average the middle of the range is simply that, an assumption. And it is often unexamined and taken for granted. Given the specifications of the Fed funds futures contract, that assumption is key to interpolating what is discounted. Frankly no one knows, but the assumptions should be explored and thought through more thoroughly.